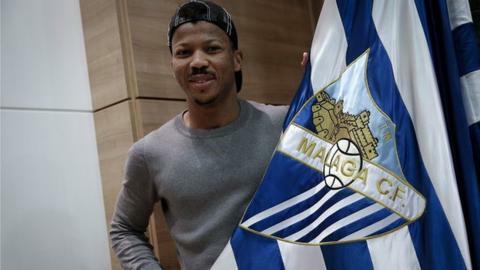 Uche said he is joining Malaga "with eagerness and enthusiasm"
Nigeria international Ikechukwu Uche has joined Malaga on loan, only six months after signing a three-year deal with Mexican side Tigres UANL. It is a quick return to the Spanish top-flight for the 32-year-old striker, who left Villarreal in June 2015. He was injured on his Tigres debut, in which he also scored, and has made no further appearances for the club. "The chance to return to Spain with Malaga came at the right time and I thought why not," Uche told BBC Sport. Uche's injury, which came after he had scored in a Concacaf Champions League game against El Salvador's Isidro Metapan in September, meant he could only watch as Tigres clinched a fourth Mexican league title in December. "Things didn't quite go as planned in Mexico, it's the unpredictability of life but there are no regrets," he said. "I made friends, witnessed the team celebrate a league title and enjoyed the support of everyone at Tigres. "The decision to come back didn't take much thought and I genuinely can't wait to get started again with Malaga. "I just want to make a big contribution, repay the trust and hopefully fulfil expectations." Uche, an Africa Cup of Nations winner in 2013, is one of Nigeria's top scorers with 19 goals in 47 appearances.